Monumental House in picturesque Rosengang. The listed transition house is located in Rosengang in north-eastern part of Lübeck's old town near the channel Travelodge in a quiet, low-traffic residential area. The attractively designed Rosengang is accessed via the Rose Street and is only accessible to pedestrians. 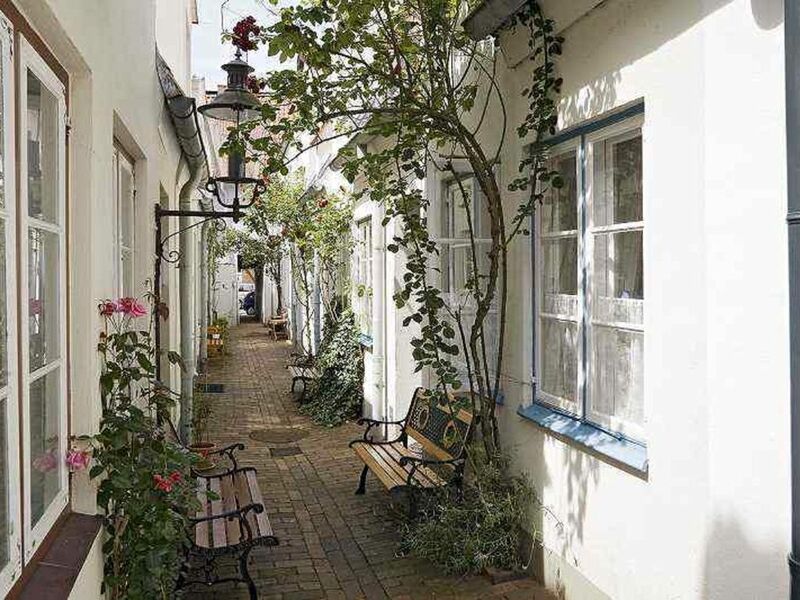 The distance to the attractive shopping areas in the center of Lübeck is just 300 meters. Many attractions, theaters and cinemas are so close. About the Kanalstraße fast connections to the supra-local traffic and other Lübeck neighborhoods is guaranteed. The house, which has an area of ​​about 35 square meters, has been carefully renovated and tastefully decorated. In the basement are the kitchen, the entrance hall and a bathroom. The upper floor, which is reached by a narrow and steep staircase, home to the bedroom. The entire device is adapted to the style of the house. For accessories of the house include a two burner stove, sink, refrigerator, dishes, coffee maker, kettle, mini-oven, a CD player with radio and TV. Parking is available nearby. The cozy sleeping area upstairs has a comfortable double bed (200 x 140 cm) and a small sitting area. Die Unterkunft im Rosengang hat uns sehr gut gefallen und war genau das richtige für unseren Lübeck-Kurztrip. Der einzige Nachtel wäre zu erwähnen, dass die Aussenbeleuchtung die gesamte Nacht aktiv war und man den Schlafraum nicht abdunkeln konnte. Wir kommen trotzdem wieder. schön zentral gelegen, alles wie zugesagt an Ort und Stelle vorhanden - Daumen hoch ! Sehr romantisches, gepflegtes kleines Haus! Die Bilder lassen den Charme dieser Ferienwohnung nur erahnen. Wir haben uns auf Anhieb wohl gefühlt und wären am liebsten noch ein paar Tage länger geblieben. Lage und Ausstattung sind unschlagbar und daher empfehlen wir dieses Haus uneingeschränkt weiter für jeden, der kein Problem damit hat sehr steile Treppen zu benutzen. Wir kommen wieder!